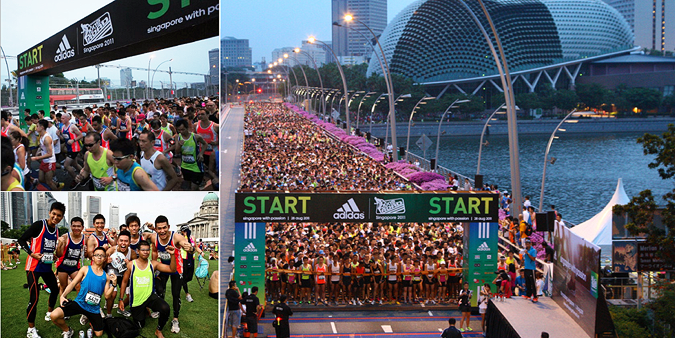 (Singapore, wownewsasia.com, 28 August 2011) – adidas, a global leader in running, has crowned the winners of its inaugural adidas® King of the Road (KOTR) race here in Singapore! Mok Ying Ren and Anne Date battled vigorously in a race against a total of 9,900 participants to take top spots in the ‘Closed’ category for males and females in a time of 57:56 and 1:04:49 respectively. They were trailed closely behind by runner ups Lim Jian Peng and Lim Baoying coming in closely behind with a time of 58:35 and 1:11:25 in a close fight for the titles. The top two male and female winners will go on to represent Singapore in an expenses paid trip to the Philippines on 23 October 2011 to compete in the finals of adidas® KOTR with the best of the best in Southeast Asia. This year, the theme 'colours' saw the launch of one of the most colourful races offered to avid runners and this was represented through a variety of different-coloured adidas® event racing tops, symbolic of the vibrancy of the sports scene across Southeast Asia. Each year, a different event theme will be introduced to add vibrancy to the race atmosphere.